Situated in Valle de Bravo, this hotel is within 1 mi (2 km) of Artisan Market, Saint Francis of Assisi Church, and Central Square. Joaquin Arcadio Pagaza Cultural Center and Lake Avandaro are also within 1 mi (2 km). 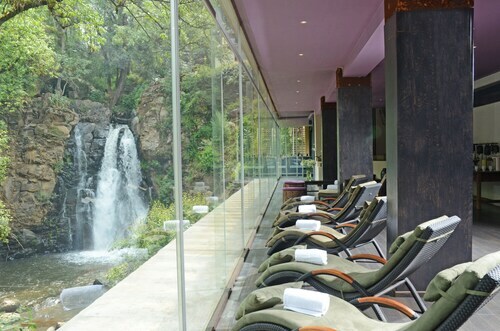 Situated in Valle de Bravo, this spa hotel is 0.1 mi (0.1 km) from Lake Avandaro and within 6 mi (10 km) of Artisan Market and Saint Francis of Assisi Church. Central Square and Valle de Bravo Archaeological Museum are also within 9 mi (15 km). 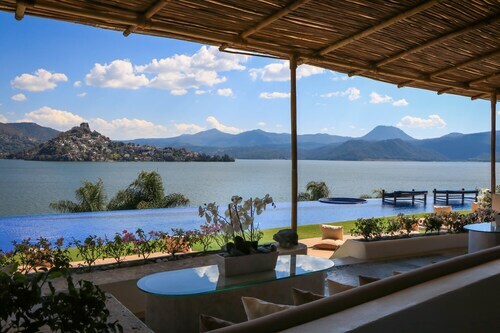 Situated in Valle de Bravo, this spa hotel is within 3 mi (5 km) of Lake Avandaro, Church of Saint Mary, and Valle de Bravo Archaeological Museum. Velo de Novia Waterfalls and Joaquin Arcadio Pagaza Cultural Center are also within 3 mi (5 km). How Much is a Hotel Room in Otumba? Hotels in Otumba start at $45 per night. Prices and availability subject to change. Additional terms may apply. Travelers to Toluca can find no end of apartment and hotel alternatives to select from in Otumba. Find inspiration with 45 accommodation options just a short drive from Otumba's center on our informative accommodation guide. Reserving a place to base yourself close to the bars and restaurants of central Otumba will hardly take you any time. Travelocity's convenient hotel guide compares the Loto Azul Resort and Spa and Hotel Tierras Blancas, which are situated within a distance of 0.6 miles (1 kilometer) of the city's center. The Rodavento Boutique Hotel is positioned 3 miles (6 kilometers) outside of the heart of Otumba. Another alternative is the Hotel La Casona Temazcal, which is situated 12 miles (20 kilometers) away. Alternative hotels are the Hotel Avandaro Golf And Spa and the Hotel Misión Grand Valle de Bravo. Situated 40 miles (61 kilometers) to the southeast of Otumba travelers will find Metepec, where you can spend a little time at the Ixtapan Aquatic Park. Ixtapan de la Sal Travelocity-registered room options include the Hotel Rancho San Diego Grand Spa Resort and Ixtapan de la Sal Marriott Hotel, Spa & Convention Center. For another option, you can check out Metepec, which can be found 35 miles (56 kilometers) to the east of Otumba. While you're there, visit the San Juan Bautista Church. The Suites Inn La Muralla Metepec and Crowne Plaza Toluca Lancaster are good options for places to lay your head. Just because you and your traveling partners are far from home, who is to say that you can't enjoy your passion for sport. Estadio Olimpico can be found 60 miles (99 kilometers) to the east of Otumba. Wise travelers that are hoping to find accommodation options in the area surrounding the game can make a choice from the Radisson Paraiso Mexico City or the Holiday Inn Mexico City - Plaza Universidad. If you are flying through Toluca International Airport and desire to book a Travelocity-listed hotel in the area, why not consider Courtyard by Marriott Toluca Airport or Fiesta Inn Toluca Aeropuerto Hotel.